Of the nine stalls selected for Saturday’s charcha, four are located near vegetable markets and are close to Muslim-dominated areas. 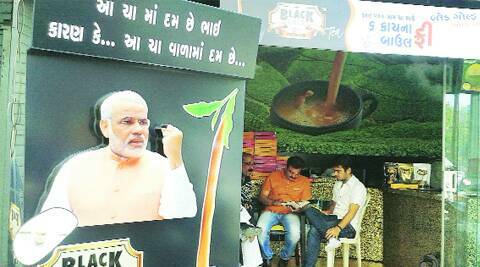 Vegetable markets in Rajkot and few other towns of Saurashtra are likely to remain more congested on Saturday as the BJP has selected tea kiosks near such places, which, incidentally, are closer to Muslim localities, for its second round of Chai pe Charcha with Narendra Modi set to discuss empowerment of women. Of the nine stalls selected for Saturday’s charcha, four are located near vegetable markets and are close to Muslim-dominated areas. Party insiders said they are trying to persuade Muslims to join its prime ministerial candidate Narendra Modi and senior party leader Sushma Swaraj in the discussion with women. Saturday, March 8, is celebrated as International Women’s Day, and so the topic will be women’s empowerment. One of the two kiosks selected in Rajkot is a retail outlet of Black Gold Tea, a private company selling tea leaves, in the bustling Para Bazar chowk near Jubilee vegetable market. Mochi Bazar and Khatki Bazar localities in the area are dominated by Muslims. Bohra Vaad, the area of Bohra community, is also nearby. Similarly, a tea stall in Mandavi Chowk in Gondal will the beam charcha live on Saturday evening. This stall is just yards from the vegetable market and entry-point to Muslim areas like Nani Bazar and Moti Bazar. The stall in Dhoraji selected for charcha is located near Juna Jakat Naka on Junagadh Road, which is also close to Baharpura, a Muslim locality. In Junagadh, the two stalls — one each on Zanzarda Road and Joshipura — are near vegetable markets in those areas. While Bapa Sitaram Hotel on Zanzarda Road is near Muslim localities Gulistan and Chobari village, the Joshipura stall is near a railway crossing where a large number of Muslim families live. Black Gold Tea is owned by Rajkot city BJP unit VP, Dinesh Karia. “We have not received any instructions to gather crowds for the event. But the area remains crowded in the evening and a big number of my customers are Muslims. So, it is likely they will stop on Saturday to see what’s going on and have a cup of tea,” says Karia. Hiren Joshi, the Rajkot district BJP Yuva Morcha vice-president, who is liaising with the Citizen for Accountable Governance (CAG), an organisation to which the BJP has outsourced the charcha campaign, said their target was to attract Sunni Muslims in particular to the charcha. “CAG volunteers have approached Muslims and invited them to join the charcha,” he added. However, Sumit Soni, local coordinator of CAG in Rajkot said his organisation was not involved in selecting Black Gold Tea. “The decision to make it one of the locations for charcha was taken by the BJP at the last moment. So, I cannot say Muslims are our target,” Joshi said, adding that other locations were finalised by CAG on the basis of feedback provided by its volunteers. The remaining locations include one in Jetpur town of Rajkot and two in Jamnagar, none of which are near Muslim-dominated areas but are on main roads of respective towns. Incidentally, Karia had held a Chai pe Charcha by installing an illuminated hoarding of Modi days before the first round of charcha on February 12. The other venue in Rajkot, Kanaiya Tea Stall, is on Pedak Road near Balak Hanuman temple that sees a heavy rush of devotees on Saturday.